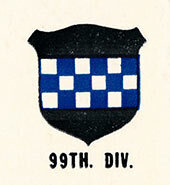 The 99th Infantry Division arrived in England, 10 October 1944, moved to Le Havre, France, 3 November, and proceeded to Aubel, Belgium, to prepare for combat. The Division first saw action on the 9th, taking over the defense of the sector north of the Roer River between Schmidt and Monschau. After defensive patrolling, the 99th probed the Siegfried Line against heavy resistance, 13 December. The Von Rundstedt attack caught the Division on the 16th. Although cut up and surrounded in part, the 99th held as a whole until reinforcements came. Then it drew back gradually to form defensive positions east of Elsenborn on the 19th. Here it held firmly against violent enemy attacks. From 21 December 1944 to 30 January 1945, the unit was engaged in aggressive patrolling and reequipping. It attacked toward the Monschau Forest, 1 February, mopping up and patrolling until it was relieved for training and rehabilitation, 13 February. On 2 March, 1945, the Division took the offensive, moving toward Keln and crossing the Erft Canal near Glesch. After clearing towns west of the Rhine, it crossed the river at Remagen on the 11th and continued to Linz and to the Wied. Crossing on the 23d, it pushed east on the Koln-Frankfurt highway to Giessen. Against light resistance it crossed the Dill River and pushed on to Krofdorf-Gleiberg, taking Giessen 29 March. The 99th then moved to Schwarzenau, 3 April, and attacked the southeast sector of the Ruhr pocket on the 5th. Although the enemy resisted fiercely, the Ruhr pocket collapsed with the fall of Iserlohn, 16 April. The last drive began on 23 April. The 99th crossed the Ludwig Canal against stiff resistance and established a bridgehead over the Altmuhl River, 25 April. The Danube was crossed near Eining on the 27th and the Isar at Landshut, 1 May, after a stubborn fight. The attack continued without opposition to the Inn River and Giesenhausen when VE-day came.